On his first full day as shepherd of the world’s 1.2 billion Catholics, Pope Francis picked up his luggage at a Vatican hotel, personally thanked each member of the staff and even paid his own bill. Then, at his first Mass, he delivered a short, unscripted homily – in Italian, not the Latin of his predecessor – holding the cardinals who elected him responsible for keeping the church strong. Pope for barely 12 hours, Francis brushed off years of tradition and formality Thursday with a remarkable break in style that sent a clear message that his papacy is poised to reject many of the trappings enjoyed by now-retired Benedict XVI. That was hardly out of character for Francis. For years, as Cardinal Jorge Mario Bergoglio, the Argentine pastor took the bus to work, kissed the feet of AIDS patients and prayed with former prostitutes, eschewing the luxurious residence that would have been his due as archbishop of Buenos Aires. But now he is pope – the first from the New World and the first Jesuit – and his style both personal and liturgical is in a global spotlight. On his first full day, he couldn’t have signaled a greater contrast to Benedict, the German academic who was meek and generous in person but formal and traditional in public. The differences played out Thursday in the Sistine Chapel as the 76-year-old Francis celebrated his first public Mass as pope. Whereas Benedict read a three-page discourse in Latin, Francis had a far simpler message. Speaking off-the-cuff for 10 minutes in easy Italian, he said all Catholics must “build” the church and “walk” with the faith. “If we don’t proclaim Jesus, we become a pitiful NGO, not the bride of the Lord,” he said. The new style was evident even in Francis’ wardrobe. Rather than wear the new golden pectoral cross he was offered after his election Wednesday, he kept the simple crucifix of his days as bishop. 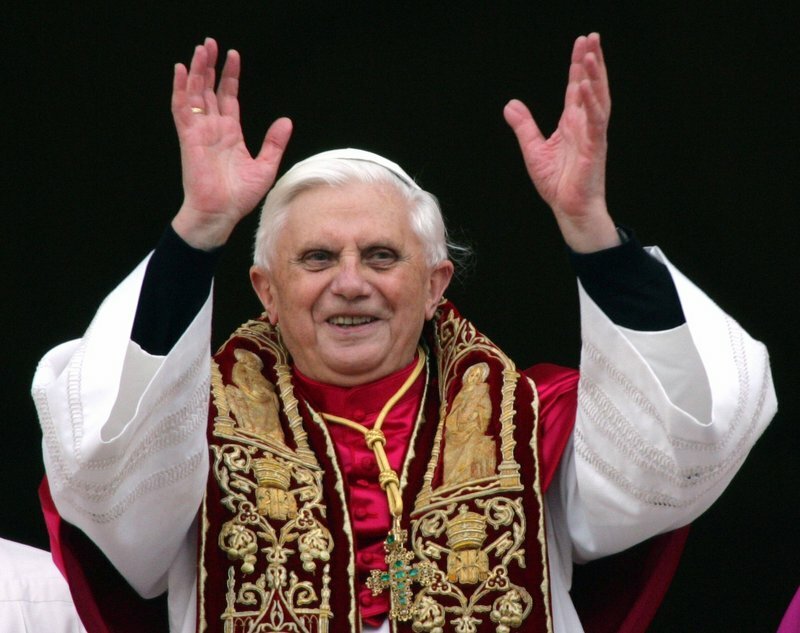 He also turned down the red velvet cape that Benedict wore when he was presented to the world for the first time in 2005, choosing the simple white cassock of the papacy instead. “It seems to me what is certain is it’s a great change of style, which for us isn’t a small thing,” Sergio Rubin, Francis’ authorized biographer, told The Associated Press. Rubin said the new pope “believes the church has to go into the streets” and be one with the people it serves and not impose its message on a society that often doesn’t want to hear it. Rubin said he expected to see more changes – even substantive ones – once Francis gets his footing. Francis began Thursday with an early morning trip in a simple Vatican car – not the papal sedan – to a Roman basilica dedicated to the Virgin Mary, where he prayed before an icon of the Madonna. 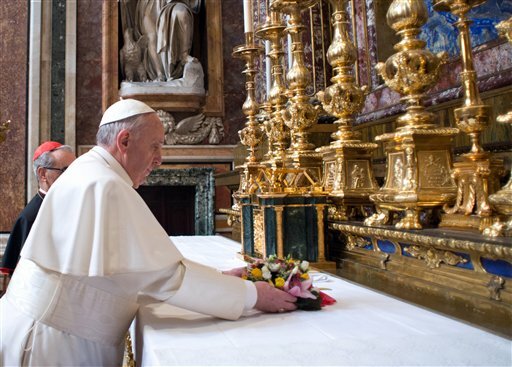 Like many Latin American Catholics, Francis has a particular devotion to the Virgin Mary, and his visit to the St. Mary Major basilica was a reflection of that. Laying flowers on the altar, he then prayed before a Byzantine icon of Mary and the infant Jesus. On Thursday, members of his flock were charmed again when Francis stopped by the Vatican-owned residence where he stayed before the conclave to pick up his luggage. But that wasn’t the only reason he made the detour. Francis then paid his bill “to set a good example,” Vatican spokesman the Rev. Federico Lombardi said. 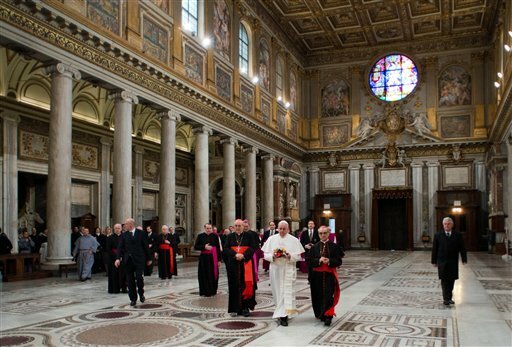 Francis displayed that same sense of humility immediately after his election, spurning the throne on an elevated platform that was brought out for him to receive the cardinals’ pledges of obedience, said Cardinal Timothy Dolan of New York. “He met with us on our own level,” Dolan said.BUENOS AIRES, Argentina – The man who is now Pope Francis was a young Jesuit leader, not long out of seminary, when Argentina’s military junta unleashed a reign of terror that became known as the “dirty war.” That was more than 30 years ago, but the reaction to the naming of the first Argentine pope shows that the wounds have not yet healed. Many Argentines were still stunned Thursday that Cardinal Jorge Mario Bergoglio, the archbishop of Buenos Aires, had become the first pope from the Americas. But the joy was somewhat tempered by a public debate over Bergoglio’s actions, or inactions, from 1976 to 1983, when 30,000 dissidents were killed or “disappeared,” among them an estimated 150 priests. 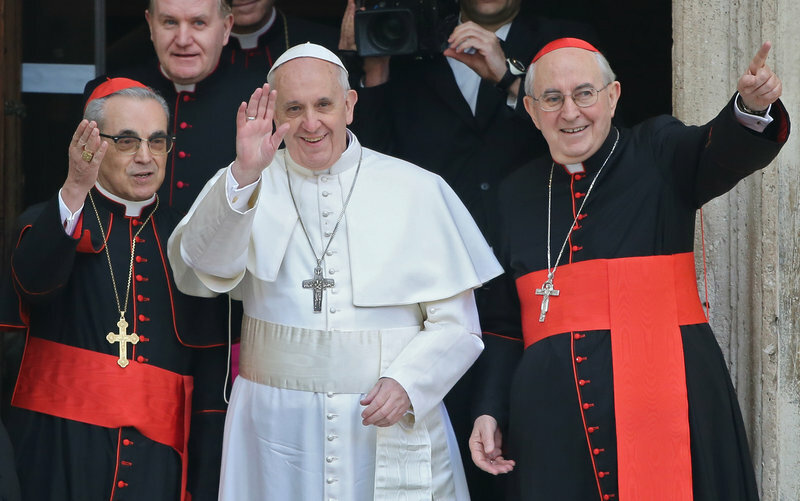 At the time, Bergoglio was a Jesuit “provincial,” in charge of the religious men’s order, and then rector at a seminary, leadership positions that would not have given him the political clout later afforded by his post as archbishop. Still, critics in Argentina have started revisiting old allegations, including the claim that Bergoglio did not protect two Jesuit priests, Orlando Yorio and Francisco Jalics, who were seized and tortured by military authorities in May 1976. The priests had been doing social work in poor areas of the capital, a suspect activity at the time, and Yorio later accused Bergoglio of in effect cooperating with the authorities by not publicly endorsing their work. However, in a biography by an Argentine journalist, Sergio Rubin, Bergoglio denied the allegation and described how he had worked behind the scenes to save the two men from being killed. If nothing else, the case of the two priests hints at the general attitude of the Catholic Church in Argentina at the time. Much of the Latin American church was strongly influenced by liberation theology, a Marxist-tinged movement that called for social justice for the poor. Although many young Argentine priests were taken by the movement, it did not make as deep inroads in the country as elsewhere, and Bergoglio is said to have resisted its influence. Nor did the Catholic hierarchy in Argentina publicly resist the junta. But supporters of the new pope point to his backing of the canonization of three priests and two seminarians who were killed in July 1976 in the San Patricio Church of Buenos Aires, apparently on orders from the junta, as evidence of support for priestly resistance to the regime.